1974 New York Graphic Society, Boston. Clamshell case: Very Good Condition. Signed, numbered and dated by Adams. 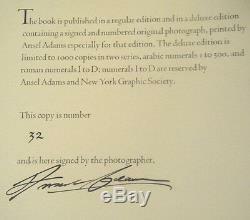 Signed by Adams, housed in a clamshell case. Number 32 of just 1000 issued. 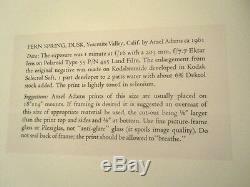 The original gelatin silver print photograph is. 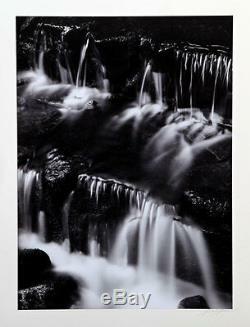 12.25" x 9", numbered 32, and was printed by. 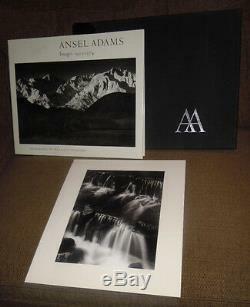 Ansel Adams from the negative. This photograph on the mount. Mounted and is loose from the book, as issued. 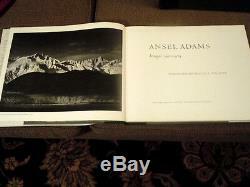 The book is also signed by Ansel Adams on the. Colophon page, and the book is also numbered 32. Corresponding to the issued signed print. Replete with sumptuous duotone images throughout. The signed HCDJ work and signed original print are housed. In its original silver AA stamped clamshell case, which does. Have two loose flap joints and overall moderate wear. This is a rare and magnificent presentation by one. Of America's legendary photographers. 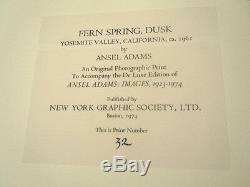 The item "SIGNED ANSEL ADAMS Deluxe Images 1923-1974 with SIGNED Print FERN SPRING, DUSK" is in sale since Sunday, May 14, 2017. This item is in the category "Books\Antiquarian & Collectible". The seller is "atlantararebook" and is located in Atlanta, Georgia. This item can be shipped to United States.